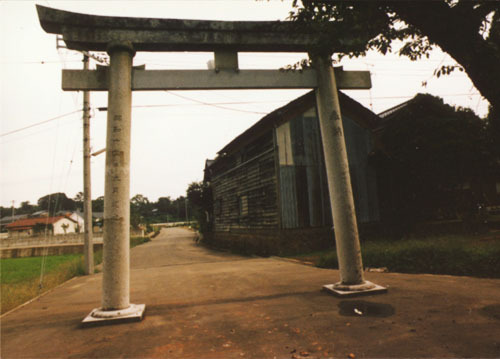 These photographs were taken on a trip to Fukui City in 1994 with my wife and mother, where I got to research my father’s family roots. You can read the story of this trip in my series of columns, “Digging for Family Roots.” You can also see my father’s family photos online. Atop this hillock rising out of rice paddies is the “jinja,” or shrine, where my grandfather paid for a torii gate to be built in 1938. It’s the larger one in front, at the foot of the steps leading up. 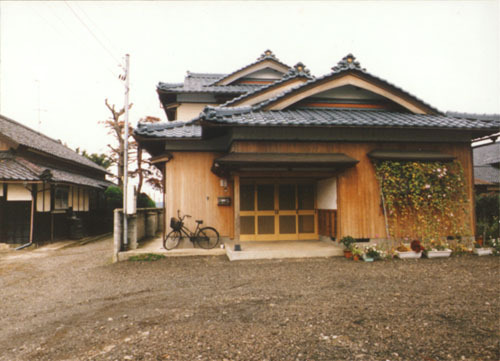 The ramshackle house on the left is where the old man came out to walk us up to the Asakawa home. 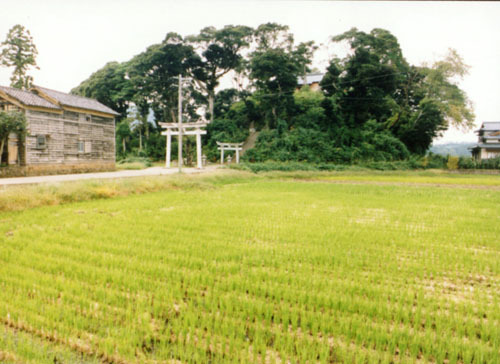 This is in the farming village of Kowata, about 10 kilometers outside of Fukui. 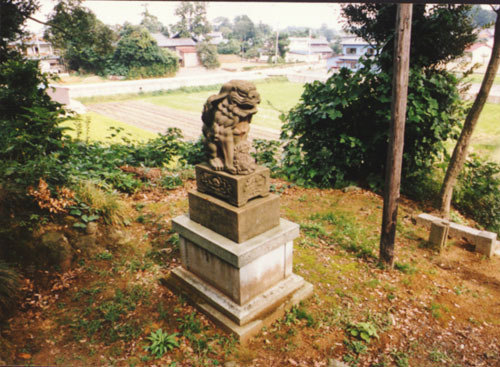 A stone lion halfway up the jinja steps. An unassuming shrine building that was closed and locked like an old garden shed was at the top of the hill. In the background you can see the rice paddies that make up much of the local landscape, and some of the farmhouses of Kowata. The farmhouse in Kowata where my grandfather, Kyutaro Asakawa, was born. It’s beautifully traditional on the outside, but also very modern on the inside, with a “modern” bathroom and Western-style kitchen with a dining table in the middle where you sit at chairs, not on the floor. 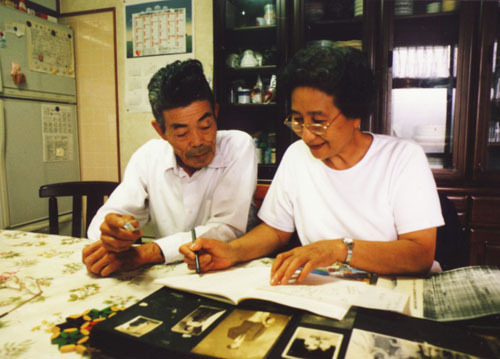 My mother, Junko Asakawa, speaking with my father’s first cousin Tadao Asakawa and looking over old family photographs while my mom checks over the Asakawa family tree. His face isn’t much like my dad’s, but his hair has a graying wave in it which my dad also had. 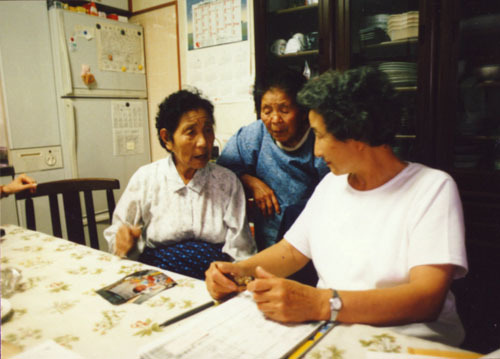 My mom interviewing distant relatives about my father’s family in the post-war years. My dad’s family moved to the countryside Kowata just weeks before the end of the war, when Fukui was firebombed. 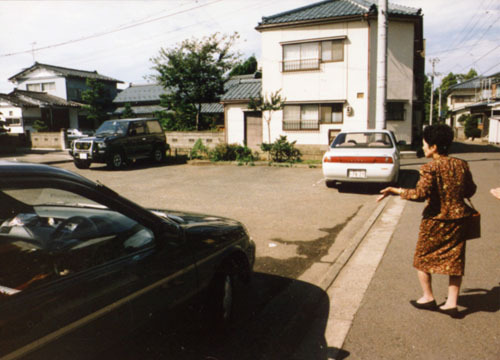 Hiroko Yamamoto, the daughter of the maid who lived for many years with my grandfather, shows us the parking lot that now stands where my dad’s family lived during most of the war. It’s in a residential district of Fukui called Asuwa. She says the house, where she played with my dad and his sisters, was large and had a garden — a luxury during the war — because it belonged to a pawnbroker before my grandfather moved in. 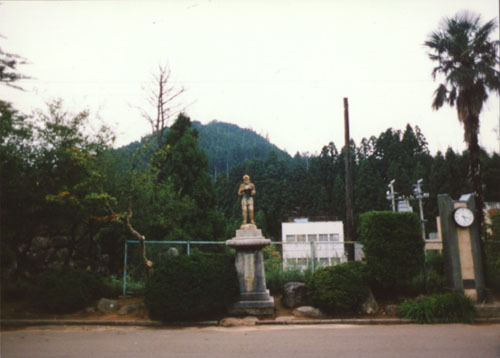 The statue that my grandfather also paid to erect in the prewar years, outside Kowata’s elementary school. It was melted down for its bronze during the latter stages of the war, and then re-cast afterwards.